Emotional eating is something that I think touches us all. Happy, sad, frustrated and stressed feelings can all have us reaching for the biscuit tin. And food can become our drug of choice. When we think of emotional eating we often think of extremes such as reaching for the ice cream tub if we've been dumped or stress eating junk food and energy drinks to get us through exams. But often emotional eating relationships are a lot more nuanced than that and can often go back to childhood and what we observed when we were growing up. 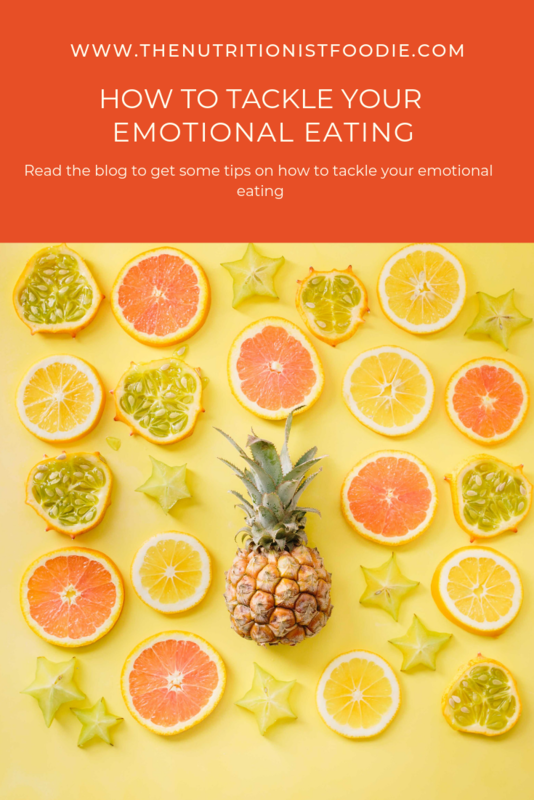 So firstly what is emotional eating? I would describe emotional eating as ANY eating decision that is triggered from a feeling other than hunger. Overeating on foods in moments of stress and often not remembering what we even eat. It’s important to note here that this food can often be healthy food not just junk, which we often only associate with emotional eating. Ever notice you might reach to eat something at arms length at your desk if you're on a particularly stressful call or have just finished up in a meeting? There is also unfortunately a double whammy effect of eating emotionally when we are stressed. Our bodies are so busy producing cortisol to prepare us to either fight or flight that we aren't able to produce enough digestive enzymes to start the digestive process and we can often feel bloated or lethargic after a few hours. Eating to relax or as a reward. Dictating the time of day/week as when we should eat a particular thing as opposed to actually letting ourselves and our bodies decide when we might want to actually indulge in a little bit of what we fancy. We arent really honouring our bodies in that sense then as we arent being influenced by what our bodies and minds actually need. And secondly if we are using food to relax it means we aren't really getting to the crux of why we feel we need to relax and perhaps choosing a better outlet in order to do that. In essence we aren't getting to the reason that we are actually feeling particularly stressed. WITH CERTAIN PEOPLE OR IN CERTAIN PLACES...We often associate emotional eatings with feelings but we seldom consider that our emotional eating can actually be triggered by certain people or being in a certain place and this is a really important thing to consider as well. Do you find that sometimes you might not eat or actually drink according to your values when you are with a certain group of friends or perhaps family? Do you worry that you’ll be judged in a certain way if you eat or drink in a certain way? Do you have a healthy/unhealthy group of friends?? Similarly do you find it difficult to stick to certain values when you go to certain places? The cinema is a great example here! I often find people find it difficult to go to the cinema without getting their beloved popcorn or pick n mix etc and this of course isn't a problem once in a while. But if you are finding that you can’t do certain things for example going to the cinema without getting these things maybe it's actually becoming more about going to the cinema to get these treats than actually seeing a film. So how do we start to tackle our emotional relationship with food? Firstly I think its good to actually contemplate on whether we have an emotional relationship with food? What were your parent’s relationships with food like? Are there any particular memories that really stick out to you? Chances are if there were certain habits that were in your household they could possibly have created some of your own thoughts and emotions around food. Secondly recognize that these patterns may exist and start to think about when you will be in these situations. So for example if you've identified that you see certain foods as being a reward ask why that is? Is it because that is what you were taught as a child? Is it because you weren’t allowed those things as a child? Journal your thoughts and feelings on these events. Be kind to yourself though. Behaviors like these can often be deep seethed and won't change overnight. Drawing awareness around these situations is so important and simply checking in with yourself is a really important step. You're just about to reach for that chocolate bar and simply catching yourself to ask whether this may be being fueled by a certain emotion is key. Take a couple of minutes to question yourself about it. This doesn’t mean you aren't going to have chocolate btw. It just means that you are or aren't fully committed to the decision you are about to make. It may sound simple but keeping food that you are only happy to eat is a really simple way to break an attachment to certain foods. So if you know you find it really difficult to keep chocolate in the house without eating it all try not keeping it in the house for a little while. It means you will have a little bit more time to contemplate your decision and actually commit to i if you do decide you want to have chocolate etc. Find some support. Changing eating habits is difficult. They are deep rooted in so many ways. It can be great to distract yourself if you find yourself reaching for the biscuit tin by doing something else or even just texting or calling a friend and let them know that you need some help. Similarly it can often be the people closest to us that may actually inadvertently support our emotional eating habits. Talk to them about this. Ask them the same questions. If you really need support it is especially important to have the support of those closest to you and who you share meals and cooking with. Do you have an emotional relationship with food? What do you find helps you to break the cycle? Did you like this post? You can save it to you Pinterest account by simply clicking on the image below.